I want to go over the main view (SamplerView), view model (SamplerViewModel) and model (Sampler) classes next. I’ve gone over the ItemsControl that populates the TPL samples but I wanted to cover the other MVVM aspects as well as what isn’t MVVM here. There are two other primary MVVM components to this. One is the image chooser, the other is the log that is populated as the samples run. Remember that the DataContext of the SamplerView is a SamplerViewModel. This means that any binding is done on this object. Near the top of SamplerView is a TextBox that contains the path to the image that is used when a sample needs an image. Next to that is a Button that opens an OpenFileDialog to choose an image. Like the sample view model, the Sampler model is directly exposed in the SamplerViewModel. As such the binding of the TextBox is to the ImagePath property of the Sampler model. The mode is set to two-way so that if a user wishes they could just paste a path into the TextBox directly. What’s new here is the Interaction.Trigger. This allows you to define a method to call for the EventTrigger, in this case the “Click” event. This has the standard OpenFileDialog code but when the user chooses a file, that path is set to the model’s ImagePath. Since the ImagePath is bound to the TextBox in the view, setting the path will update the TextBox to the correct path. Setting this image path has the side-effect that the images within the application get updated. There are three important aspects to this. When ValidateProperty is called it verifies that there is an image path and that the file exists. If either of these are not true than an error is added to the error container in the base domain object that allows the application to provide feedback to the user that there is an error. Two is the RaisePropertyChanged event. This is pretty standard when binding as this notifies any observers that are bound to this object that the property has changed, that way they can change the value as they need to. This is the side-effect of updating the image path. It causes the two images in the view, which are bound to the SourceImage and DestinationImage, to get updated. Since the ValidateProperty takes care of providing the user with the feedback that a file may not exists we don’t have to do any error handling beyond just making sure the image exists. The last MVVM component of interest is the Submit button. Like the ChangeImage button above, this is bound to a method in the SamplerModelView. This method is run with async/await so the UI isn’t locked when the samples are run. I’ll discuss async/await in detail later in this series. It just runs the method to run the samples in the Sampler model. In the next post I’ll go more into depth on running samples. These are bound to the SourceImage and DestinationImage properties of the Sampler model, standard MVVM stuff. What’s not MVVM are the repeat buttons that move/zoom the images around. I opted for this approach, using regular code-behind, because the moving/zooming of the images doesn’t really have anything to do with our models. It doesn’t have anything to do with running samples or any data associated with the samples. Because of this it didn’t make sense to bind the buttons that move the images using an event trigger to methods in the SamplerViewModel. In this case it would have convoluted our ModelViews just for the sake of using MVVM. This is what I meant in the first post where I referred to this as a composite application. MVVM for the sake of MVVM is counter-intuitive and counter-productive. The purpose of our ModelViews and Models is to focus on running TPL samples and giving the results of those samples back to the user. Up next is running samples, getting the data to the samples and getting the results back from the samples. Let’s take a look at SampleView, SampleViewModel and the base Sample class all of our models extend from so we can get a better understanding of how this works. In the first set of samples included with the code the only controls we need are a checkbox to identify which samples should be run. As we expand the capabilities of the samples to demonstrate more functionality of the TPL we’ll need to increase that. 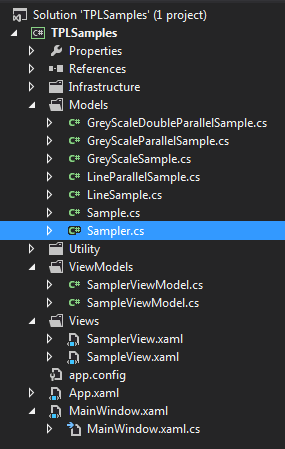 For now, however, you’ll see that the SampleView.xaml is really as simple as can be. We have the boilerplate WPF code with the standard references and <Grid> as well as our checkbox. The code-behind is the boilerplate created code with nothing added. Important here is how the checkbox data gets populated. Remember that in the ItemsControl of the SamplerView, each ViewModel that is added to the observable list the framework will bind to a view which, conversely, has as it’s data context the view model it’s bound to. Additionally, when constructing the ViewModels, they take an instance of a sample. This is how we get our View <-> ViewModel <-> Model. Let’s take a look at our SampleViewModel so we can understand what is happening in it. That’s it. It just exposes our sample directly. Looking back at the xaml for our view, you can see that the content of the checkbox is bound to “Sample.SampleName”. Since the view has the view model as it’s data context that means we are bind the content of the checkbox to the name of the sample model. Note that there are instances when you’re not dealing in clear-cut models that it makes sense to simply incorporate the aspects of a model into the view model. It also makes sense when you want to limit the exposure of your model that you may not expose the model directly but may wrap properties in calls to the model (for example if you need to handle multi-threaded scenarios where you have to lock on properties because there may be only one instance of the model). In this case we are dealing with very obvious models and there is no reason here to limit the exposure of the model so the model is just exposed directly for binding. One of the critical aspects of this binding is the IsChecked property. You can see that we have a “Mode=TwoWay” parameter on the binding. This means that not only does the value of the IsChecked property get set from the model, but if the value of the IsChecked property changes it will update the model. In terms of the purest implementation of MVVM this is what is problematic with exposing the model directly. The view model is supposed to act as a controller for the interface from the view and to the model. Exposing the model directly means the the view model is no longer controlling the model but instead the view is. With our samples we could have rolled the model into the model view. To simplify what is already a fairly complex set of code for something so simple as well as showing how view models work in MVVM I created view models but exposed the model. Finally we need to look at the Sample base model that all samples derive from. The vast majority of my samples need a consistent set of data to work on so we can compare times of execution. The easiest way to do this is just take an image on the Run method. This way, if we want to test our samples under different loads we can just use a bigger or smaller image. The Results property is unused and will be removed from future sets of the code. Originally I had envisioned that as the sample needed to display something to the user it would just update the Results property. Obviously this doesn’t work as the user doesn’t get immediate feedback but instead will only get updated when the sample completes its run. I replaced this with an Action that takes a string and in my SamplerViewModel the action updates the results in the Sampler model. This way the user gets continuous feedback from the sample as it updates. As the samples run, if they use an image they modify that image. The ImageRequired property is important because it is potentially expensive on the front-end to reload the image if a sample doesn’t need it. Especially in cases where a large image is used. And that’s it for our Sample model. I realize that the initial set-up of MVVM can be complex. Even some of the implementation of the View through ViewModel to Model work-arounds that have be put into place to handle things that are fairly simple when working with code-behind can be downright ugly. The pay-off is that supporting long-term maintenance should be a lot easier. That’s the tough part to get across to a lot of people. You will have a lot more overhead when initally spinning up an MVVM solution but in the end you will find that it is all worth it during maintenance as you fix bugs and add features. If nothing else then because of how cleanly separate your tiers are. Up next is a more in-depth explanation of our SamplerView, SamplerViewModel and Sampler model.